Anyway. Once you start, it is impossible to kick the habit of being aware of the garbage you are putting into your body. While healthier and more organic choices are becoming more readily available these days, there is still So. Much. Crap. You don’t have to worry about any of that with Old SchoolFavorites. 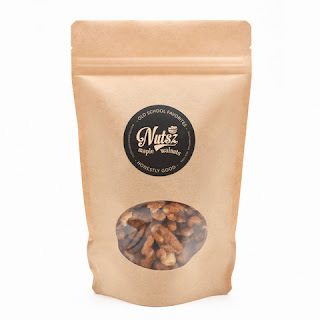 The concept behind Old School Favorites’ gourmet nuts and chocolate sauces is one of taking it slow, using fresh, quality ingredients in small batches, “the old school way”. The ingredients are pretty simple: fresh cream, butter, Madagascar vanilla, sea salt, cocoa, stoneground Taza chocolate. No artificial additives or preservatives. And, most of all, you can actually taste how exponentially better the real thing is. The chocolate is dark and very “real”. If you’re accustomed to Hershey’s chocolate flavored corn syrup, this blows it right out of the water. The flavor was very subtle in the peppermint variety, and the cayenne had a kick, but wasn’t too spicy, for me, anyway. If you’re an absolute wuss in the spice department, consider the other flavors. The Nutsz are maple-walnut crack. Sweet and slightly salty, you can sprinkle them on ice cream, eat them in yogurt, or shovel them down right out of the bag. The Szauce itself is very thick and frosting-like in texture, so if you intend to serve it over ice cream or use it to a pourable effect, you should heat it briefly in the microwave -- not too long or it may burn. However, if you’re going to shamelessly eat it out of the jar like myself, dig right in. One warning: the products will disappear quickly, so it’s perhaps better suited to gifting purposes unless you intend on buying it by thecase. Old School Favorites makes custom gift baskets and personalized labeling. Heat milk. Stir in Szauce until thoroughly mixed. Add booze, and top with whipped cream and chili flakes. More chocolate and/or booze may be added to taste. I do realize that by this point, oh readership, it’s closing in on springtime. 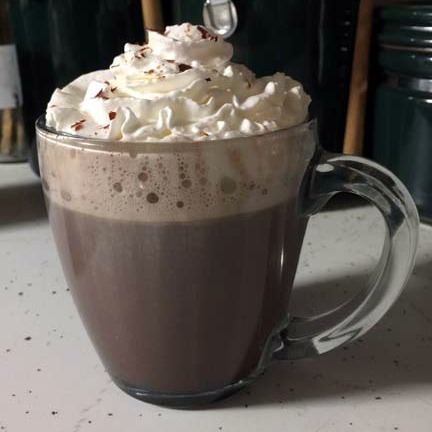 But there are probably a few cold nights left in the Midatlantic, and no reasons not to drink booze-laden cayenne hot chocolate. I think my logic is sound, and once you try it, you'll agree. Old School Favorites is generously offering one of our US readers a gift basket that includes one of each of their products, plus an apron or hat (your choice) as a giveaway for you, Dear Readers. You won’t be disappointed! Read on to see how you can enter. 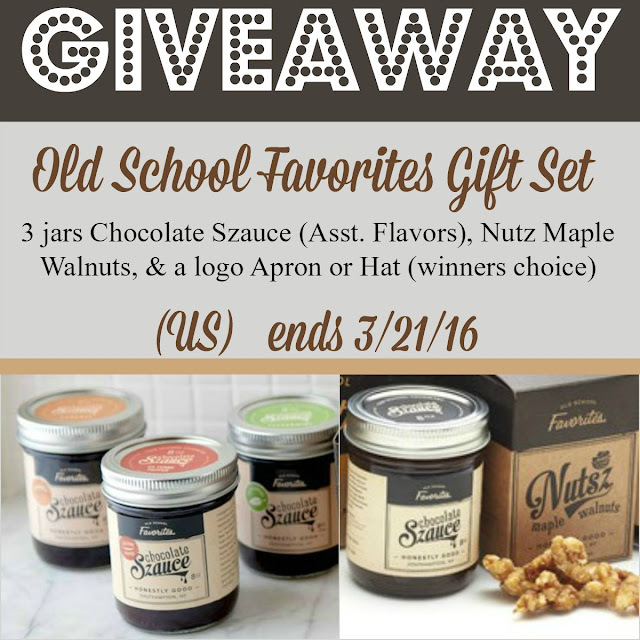 One winner in the US will win one gift set from Old School Favorites to include 1 each of their 4 Chocolate Szauce flavors, 1 package Nutz Maple Walnuts, and winners choice of either an Old School Favorites hat or apron. This giveaway is open to US RESIDENTS ONLY and will end just before midnight ET on 3-21. The Nutzy Apple Pie with a crust made from their Maple Walnuts and Oats looks amazing! I'd use the sauces on ice cream or to try one of Aurora's Winter Warmers. I love the blend of chiles and chocolate! I would love to try the flubber cake! I would use these to spice up my desserts! I'd try making the Marble Pumpkin Bread. I would love to make the recipe for the Delicious Texas Sheet Cake. That recipe brings back memories of childhood church dinners. 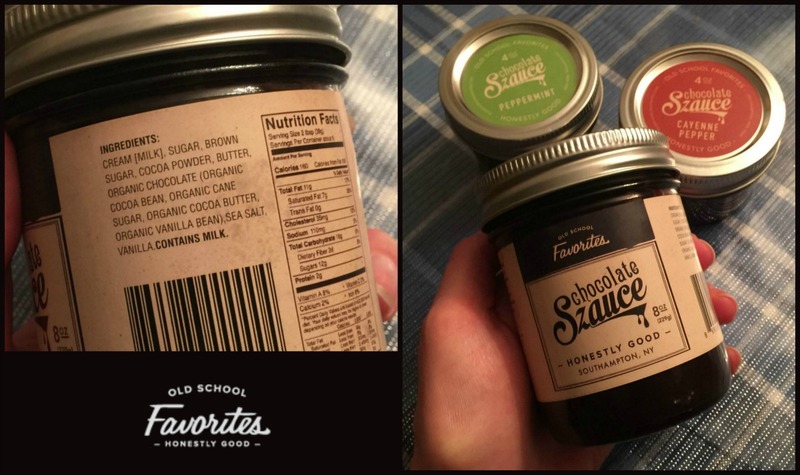 I would love to use the original indulgent gourmet Chocolate Szauce from Old School Favorites. The Texas sheet cake looks yummy! I would like to make the Delicious Texas Sheet Cake recipe. If I won, I would use the Chocolate Szauce on my homemade brownies. The Marble Pumpkin Bread sounds delicious! I would use the Chocolate Szauce in a milkshake. I would love to make the Layered Samoa Brownie it looks so delicious my family would love it. I would like to use these for my next party and have an ice cream sundae party. I would like to try the recipe for Delicious Texas Sheet Cake. The first thing I would make is the Marbled Pumpkin Bread. I would use the Chocolate Szauce in hot cocoa. I would like to try to make the Marbled Pumpkin Bread. The Texas sheet cake looks amazing. Love the Winter Warmer recipe. I've never heard of chocolate sauce with cayenne pepper and can't really think what it would taste like. Thanks for sharing your recipe with us at #OvertheMoon linkup and see you next week. Would love to try the marbled pumpkin bread! I would drizzle some warmed-up peppermint szauce over vanilla ice cream! Yum! I LOVE cheesecake so I think this would be perfect: Double Chocolate Cheesecake with Nutsz. The Oatmeal Chocolate Szauce Cookies sound very good. The Chocolate Szauce sounds amazing and I would love to use it over ice cream sundaes! yummmy! The Nutsie Apple Pie using their products looks great. I'd use my chocolate sauce to make a whole wheat pizza with their sauce and strawberries. A little white chocolate drizzle. The Layered Samoa Brownie, Nutszy Apple Pie and Szauce Marble Cake are three recipes I would be very interested in making with the Chocolate Szauce . I love the Maple Blondies and can't wait to start making some new desserts. The Cayenne Pepper Chocolate looks interesting. The marble pumpkin bread looks delicious! Yummy! These products sound terrific! Thanks for sharing with us at #FridayFrivolity and hope to see you again next week! I'd like to try the Cayenne Pepper Chocolate Szauce and the recipe for Marble Pumpkin Bread looks awesome! Those Layered Samoa Brownies look like a great thing to make! I would use the sauce with ice cream. 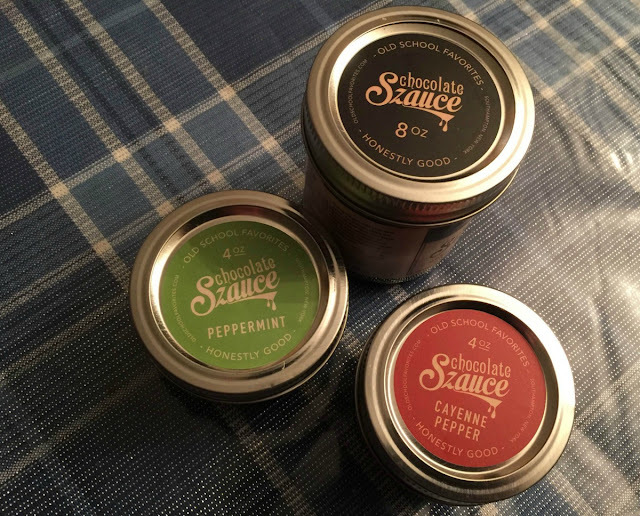 The cayenne pepper chocolate szauce sounds good. This hot chocolate looks amazing!! I'm thinking it would be great while we are camping!! Yum!! Thanks for sharing on My 2 Favorite Things on Thursday! Hope to see you again tomorrow! Pinned!! I had hot chocolate with cayenne at a restaurant, but never made it at home!! Pinning for sure!! And thanks for sharing at the "What's for Dinner" linky party! That Hazelnut and Szauce Sandwich Cookies recipe looks pretty incredible! I think I'd have to give that a try!! I would like to try out the Healthy Pumpkin Bread recipe. Looks good! The szauces would be great on desserts and in my tea. I'd like to try the Caramel Chocolate Szauce. Sounds like it would be good in a coffee. I'm drooling! I'd love to try making the Delicious Texas Sheet Cake. Maple Blondies would be great. Texas sheet cake. Oh I would use it as a "glaze" for cakes or brownies and also on ice cream. I would love the Hampton Road gift set. All of the products look yummy. I would like to try making the Layered Samoa Brownie. i would put the sauces on ice cream. i want to try the peppermint chocolate sauce. it sounds so good. I would like to make the Double Chocolate Cheesecake with Nutsz. I would like to try to make a recipe with the Cayenne Pepper Chocolate. Wonder if it would taste great im Mexican mole, just a thought. The Chocolate Peppermint Cookies recipe on the website sounds delicious. I think I would use the original chocolate sauce in our peanut butter pie. I like the Layered Samoa Brownie recipe. I would use the original chocolate sauce to put on it. The chocolate cinnamon bread pudding looks good.it has the chocolate sauce in it. the CARAMEL CHOCOLATE SZAUCE and on apple slices! I definitely want to make the Double Chocolate Cheesecake with Nutsz. I would love to try the Double Chocolate Cheesecake with Nutsz.